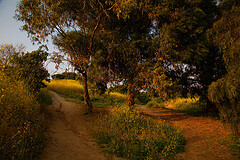 Ernest Debs Park is a scenic place and not widely known within the City of Los Angeles. It is, however, very expansive and offers some breath-taking views. Many of the few who know of this 300-acre sprawl of land describe it as "a gem", and a rarely touched one at that. On the west side of the park is an Audubon Society Center, but other than this and a few roads and trails, the area is virtual wilderness. Nestled somewhere amidst the native trees and brush is a pond that offers a breathtaking view of the city's Downtown not more than ten minutes' drive to the southwest, and there is yet another body of water that offers fishing prospects. Native migratory birds can often be found here (hence the Audubon Society Center in the west), creating a wonderful place for birdwatchers of all calibers. Despite its beauty and serenity (or perhaps contributing to both), Debs Park is largely unused by the general public — but those few who do frequent it don't seem to mind this. Somehwere within Ernest Debs Park is an Audubon Society Center. It is a great pull for bird-watchers.